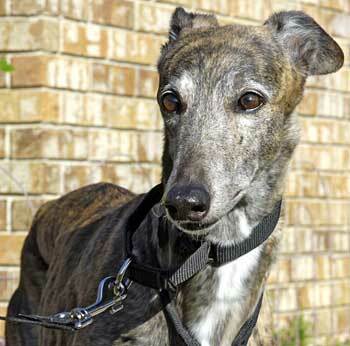 Mariah is an 11-year-old, dainty little brindle lady who recently found herself without a home. 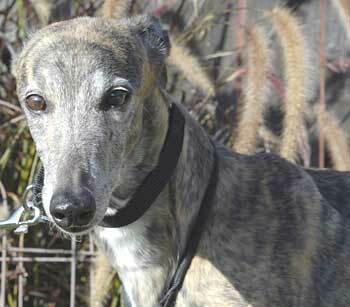 Mariah lived for a while with a military couple in Las Cruces, New Mexico after having been adopted in Kansas. But when the couple received transfer orders, they decided they couldn't keep her and took her to a local veterinarian in the hopes that a new home could be found for Mariah. GALT was contacted, and Mariah moved to Texas. Nothing more is known about Mariah's past as her ear tattoos are faded and her litter registration is no longer readable. Her birthday tattoo shows 25C, indicating she was born in February of 1995. She is very quiet girl, a bit bashful, but quickly warms up to anyone who knows about ear scritches and chin rubs. It's tough on any dog to be given up, but even more so when they are in their golden years like Mariah. 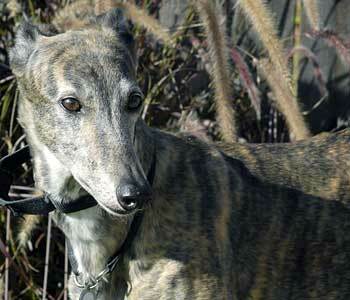 Sweet and unassuming, Mariah is as beautiful as her name and a tribute to all senior hounds. She is cat tolerant.